Kiss Me Dupli-Kate, quipped playwright Russel Crouse, author of Red, Hot and Blue, when he heard of plans to set up a second, ‘national’ KMK company that would tour the show around America while the Broadway company continued its long and successful run. This was on the drawing board only weeks after the show opened in New York, and 75 performers auditioned for the leading roles. Unlike the Broadway version, it seems to have been a more straightforward matter to cast Lilli than Fred. After all, they had already seen a lot of hopefuls before settling on Patricia Morison, and for a while it looked as if that the touring Lilli was to be one of them, Frances McCann – until she discovered she was pregnant. No Kiss Me Kate spankings for her! 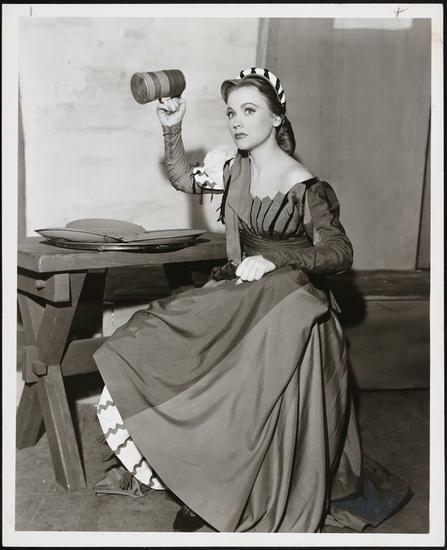 But another of the possible Broadway Lillis was also unexpectedly free: Anne Jeffreys had started the theater season in My Romance, but the show closed after 95 performances on January 8, 1949. The main problem was getting her out of her contract, which included an option on her services even after My Romance was defunct. The deal was done and Anne was hired by mid-February. He was under their very noses! Keith Andes, Alfred Drake’s understudy in the Broadway show, proved himself by going on for the star and giving 22 successful performances, and in May, he joined Anne Jeffreys at the head of the national company cast list. Rehearsals began in New York the following month, while Andes continued on stand-in stand-by for Alfred Drake, before going west to open in Los Angeles on July 11. 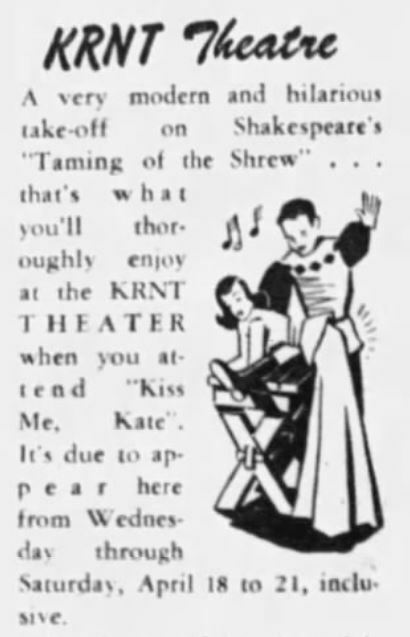 But this wasn’t the first Kiss Me Kate to be seen outside New York. That took place in Canonsburg, Pennsylvania, from June 15 through 17, when the Margo Thomson School of Dancing produced the musical by special arrangement. whose mother happened to be the director of both the school and the show. The national company opened in Los Angeles just under a month later. At first, it didn’t do very much touring: for the first ten months, it played just three cities, four weeks in LA, six weeks in San Francisco from August 8, and 32 weeks in Chicago from September 22. To publicize the Chicago opening, Keith Andes and Anne Jeffreys also played a half-hour condensed version on the radio on September 20. 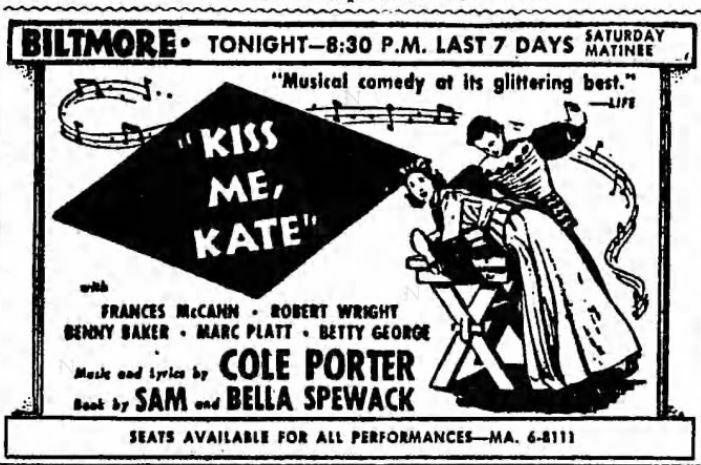 This was evidently a successful, sought-after show: both runs in California sold out within a week, and although technical and transportation problems meant that the curtain went up an hour late on the first night in San Francisco, everyone was so keen to see Kiss Me Kate that they didn’t mind. 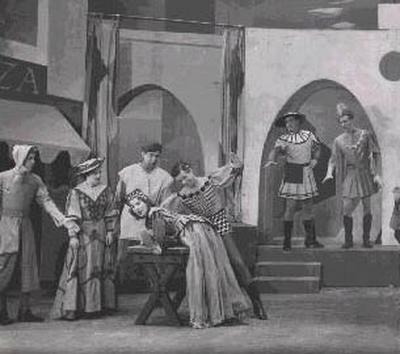 Contemporary reviewers tell us that this was a markedly different Kiss Me Kate from the Broadway original, though of course the script remained the same. 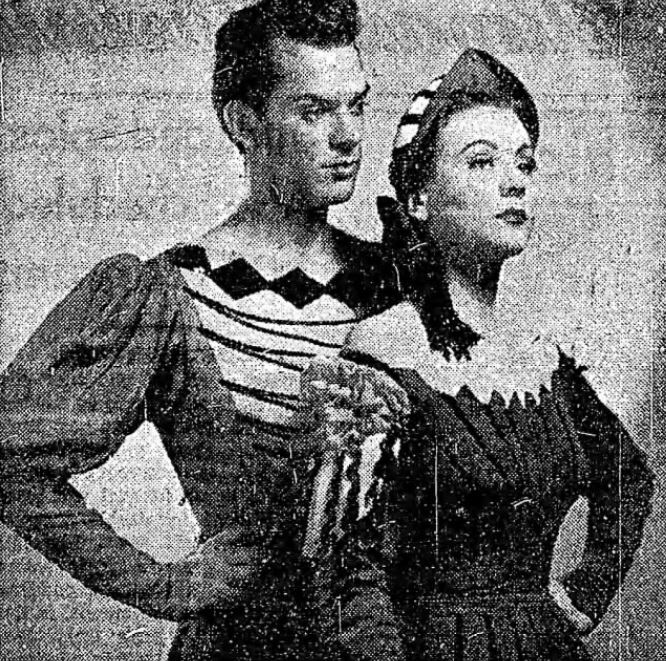 Some of that difference must be attributable to the circumstances in which they saw the show: they were invited to attend the final rehearsal in New York, before the stage costumes were ready – so Lilli was spanked in contemporary dress, which happened to be Anne Jeffreys’ own clothes. And Anne herself was the other big difference. 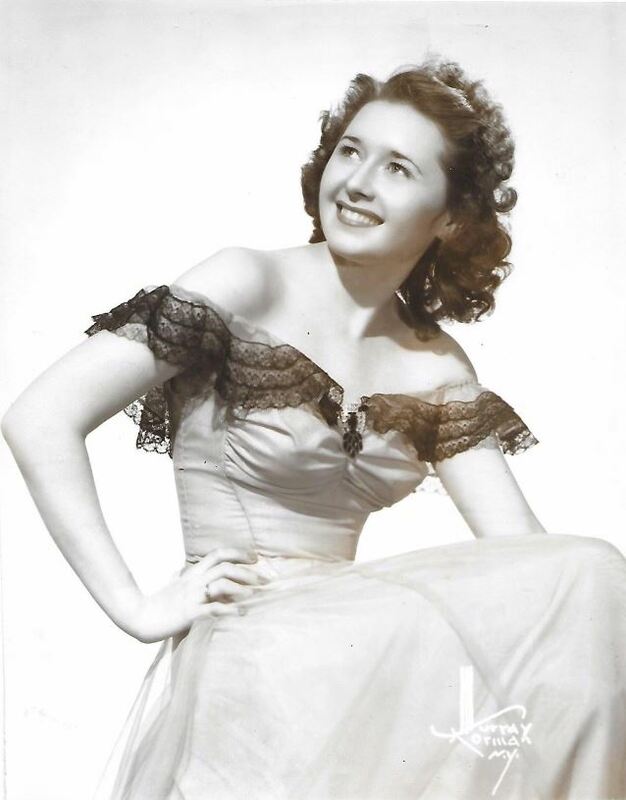 She had seen the Broadway production in January 1949, not knowing that the show wasn’t just a ‘might-have-been’ from her recent past but also a big part of her immediate future. 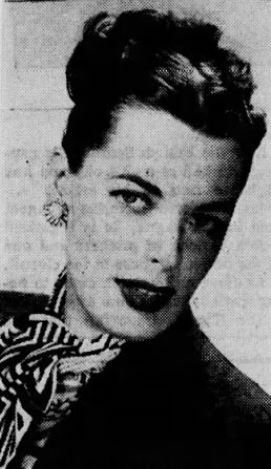 But as soon as she was cast to play Lilli, she made a point of not seeing it again, because she wanted to develop her own unique interpretation of the role without any influence from what Patricia Morison was doing with it. The critics were more than satisfied: according to some, Anne’s Lilli was even better than Pat’s. So when Patricia Morison and Alfred Drake left the Broadway production in June 1950, there was no question who should replace them. The show closed in Chicago on May 6, opened at the American Theater in St Louis two days later, and Anne Jeffreys and Keith Andes gave their last national company performances there on May 19 and headed for New York for two weeks’ rehearsal. But who should replace them in the national company? There was talk of Paul Raymond as the replacement Fred (that’s Paul Raymond the minor American actor, not Paul Raymond the English pornographer); but in the event, Andes handed over to his understudy, Robert Wright, who thus began a long association with the part. As for Lilli, the management once again tried Frances McCann, who had turned down the role on Broadway in 1948 and couldn’t accept the national company in 1949, and this time she felt she had no option: ‘It is so seldom that opportunity knocks three times,’ she told the press. Her first appearance was in the last two performances in St Louis, the matinee and evening shows on May 20. 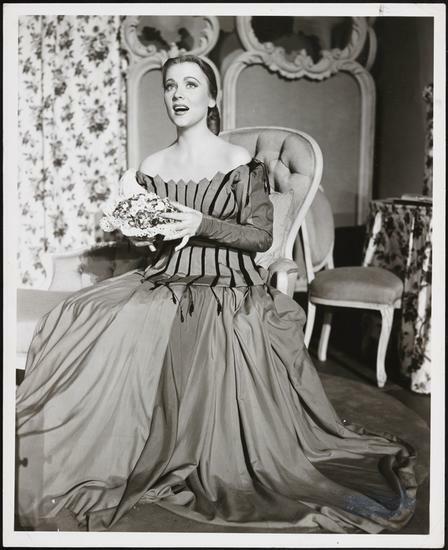 When the audience was told that she would be going on in place of the advertised Anne Jeffreys, their disappointment was audible – but it quickly turned into enthusiasm when they saw her performance. ‘The role of Katharine affords Miss McCann much satisfaction but she also pays a price for it. there are parts of her body that are black and blue and these marks have been acquired during the course of her emoting in Kiss Me Kate. For this you will have to take her word, since the bruises occur in the places of her anatomy which no lady can display in public and remain a lady. To drop a hint: she sometimes has difficulty in sitting down after a performance. And on her dressing room table, she kept a supply of arnica and collodion, for regular application to her soundly spanked bottom. 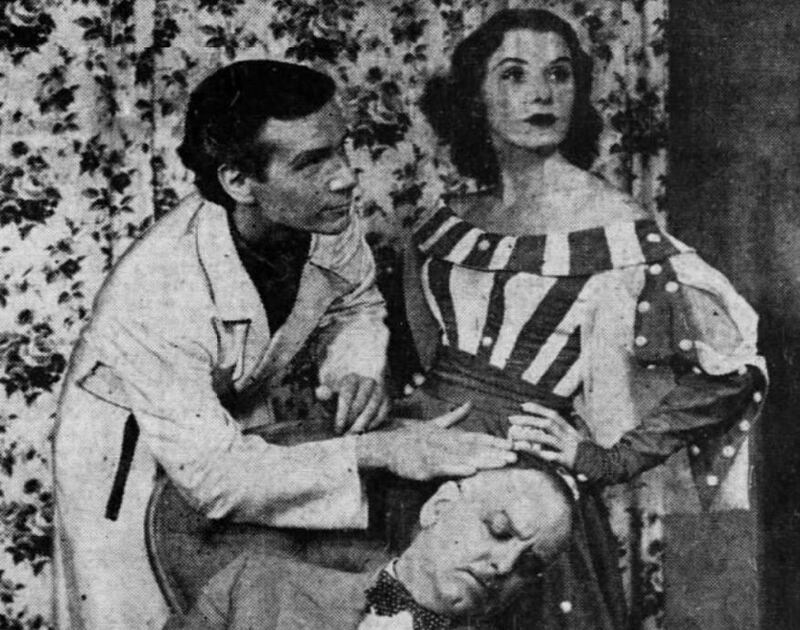 Martha had understudied the role of Lilli from the very start of the national company run in June 1949, and one of the first things she heard from a very determined Anne Jeffreys was that she would never get to go on, under any circumstances: no matter how incapacitated Anne might be, she would never allow her understudy to take her place, for the simple reason that ‘if I don’t go on, I don’t get paid’. So Martha waited in the wings and took her spankings at understudy rehearsals, all the while knowing it was a dead end job for her. No actor wants not to be paid, but Frances McCann was a more generous star when the tour reached Oklahoma City. It happened to be Martha’s home town, so Frances allowed her to do the final show there. And then, in Dallas on December 27, she developed a throat infection, and Martha had to go on at 50 minutes’ notice to give what was said to be a ‘flawless’ performance, spanking scene and all. After a year of spankings, Frances McCann left Kiss Me Kate at the start of June and went into a West Coast tour of the 1944 musical Bloomer Girl, to play Evalina – who is rebuked by her beau for appearing at a fashion show wearing only her bloomers, although he adds, ‘Well, I’ll admit it’s much handier for applying a hairbrush.’ Out of the frying pan, into the fire for Frances? And so the national company had to cast yet another new Lilli. But before we can go into the complexities of that, we must first follow Anne Jeffreys to Broadway, in the next part of this article.